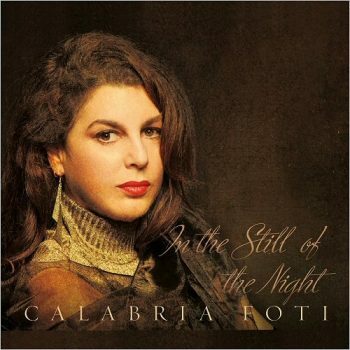 With In the Still of the Night, vocalist Calabria Foti joins the ranks of Ella Fitzgerald, Frank Sinatra, Oscar Peterson, and many others -vocalists and instrumentalists -who have dived deeply into the Cole Porter canon. It takes a very special talent to deftly probe the poetic and pithy romantic lingo that the Classic material offers. So, while that ocean is Trench deep, how is one to pluck new musical perspectives and give old ones a novel patina? Foti, along with a cadre of musicians of same mind, does so and strikes it rich here. Launching into things with a marvelous Latin-tinged send-up of “Just One of Those Things,” we get the immediate idea that this run-through of Porter’s material—11 of his greatest from Broadway and Hollywood -is going to be a fine and unique ride. Whether it is a “fabluelous” send up of “Miss Otis Regrets” or any of the rest, the selections here are delivered with an elegantly restrained texture that’s spearheaded by Foti’s marvelously versatile and in-command chops. While Foti’s voice is pitch-perfect and liquid gold, the keen thing about her effort stylistically is her extraordinary rhythmic and dynamic sense and the manner in which she plays with the beat (“Anything Goes,” “Night and Day”). A careful listen yields an almost Chet Baker-esque approach to time. Key words in each lyric line are subtlely emphasized and de-emphasized with an instrumentalist’s flair (“What is This Thing Called Love,” “Every Time We Say Goodbye”—with neat cello quotes of “Goodbye” and “My One and Only Love” -and “Get Out of Town”). There’s no saccharine served at this table. That’s no surprise, since Foti is a heralded violinist, as well as a premier chanteuse. Ever get that sense you’re experiencing a memorable musical candlelight dinner conversation? You will here. (“I Concentrate on You,” “In the Still of the Night”). It’s luscious stuff. The ensemble on the session—all crème and superb throughout—includes producer/arranger pianist Michael Patterson (an outstanding job), guitarist Gene Bertoncini, bassist Ike Sturm, cellist Richard Locker, and drummer Jared Schonig. Cameos across the date by clarinetist Eddie Daniels and trombonist Bob McChesney add savory fill material always in perfect synch with what’s going on. There’s no stepping on heels in this dance. In the Still of the Night is certainly a fine addition to those aforementioned classic Songbook albums of the Greats and one that entices and enthralls with sublime taste. It is indeed the genuine turtle soup.